Map location feature added in Multi Memo now v2.3. From now on geo location of the point where the memo was written is stored with memo data. You can review it later in (long press) context menu "Map location" of each memo item. Please note this feature requires extra permmisions of MultiMemo regarding acquiring gps position and you need to fix gps position before hand if you want to record a precise position. It would be useless that we set a password in finger-writing memo obiviously. Instead, many users have requested text memo password setting function and now we have it. 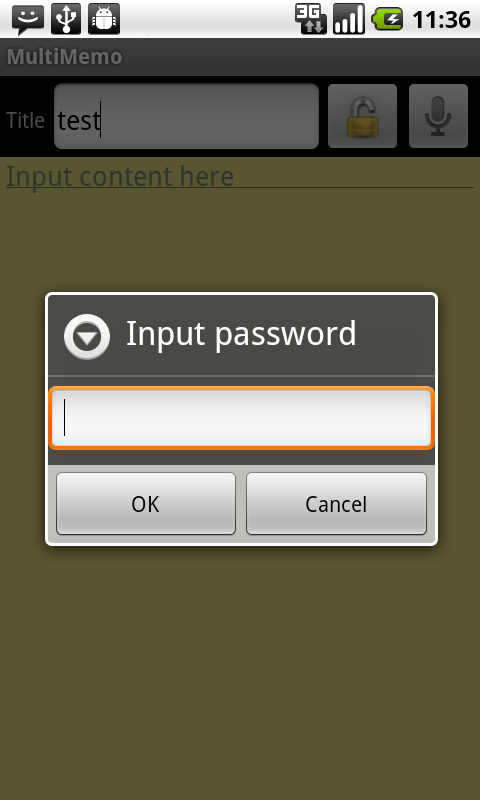 By using lock left to voice icon, After password is entered, setting password for the text memo can be done. You can also unlock it later if you press lock button again. In v2.3, froyo move to SD supported so you can save up internal storage space.